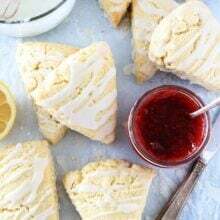 Lemon Cream Cheese Scones – This easy scone recipe is made with butter and cream cheese, making soft, tender scones. 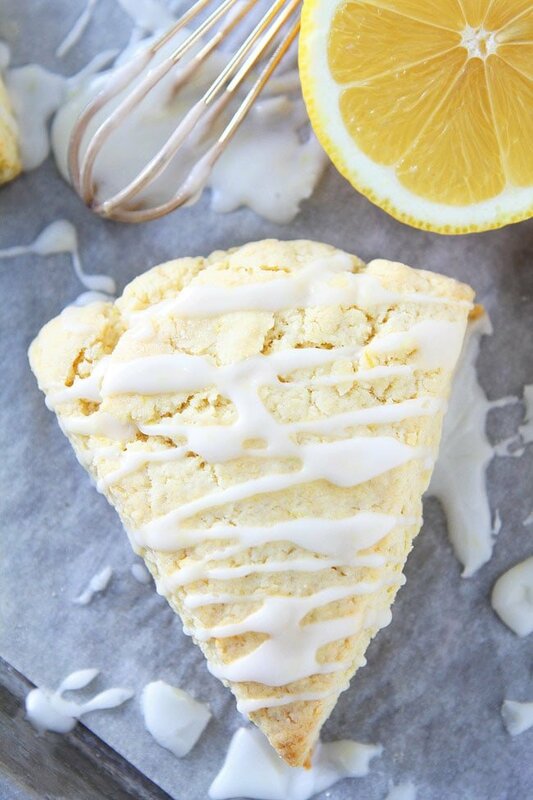 Finish them off with the sweet lemon glaze, and you have perfectly delicious lemon scones for breakfast or brunch. 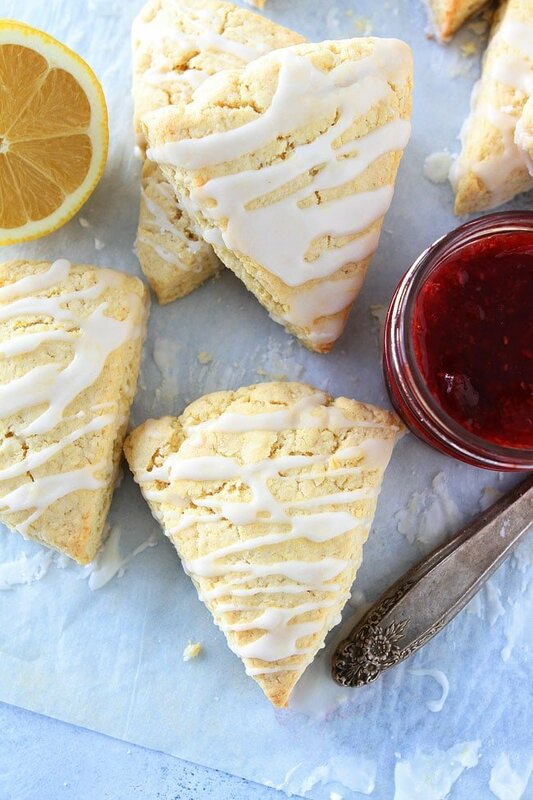 I wish a plate of Lemon Cream Cheese Scones would magically appear in front of me right now. They are SO good! 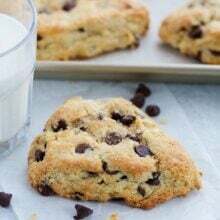 You are going to LOVE this scone recipe. They are always a hit for brunch. 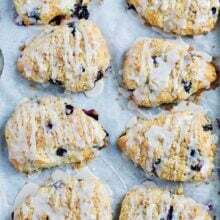 I love brunch because you get to enjoy breakfast and lunch recipes and sweets are totally acceptable, like these delicious scones! They are guaranteed to be the hit of any brunch! Scones are one of my all-time favorite breakfast treats. I actually like them more than muffins and cinnamon rolls. Well, except for my dad’s famous cinnamon rolls, nothing beats my dad’s cinnamon rolls. I really love this scone recipe because the flavors are simple, but oh so good! 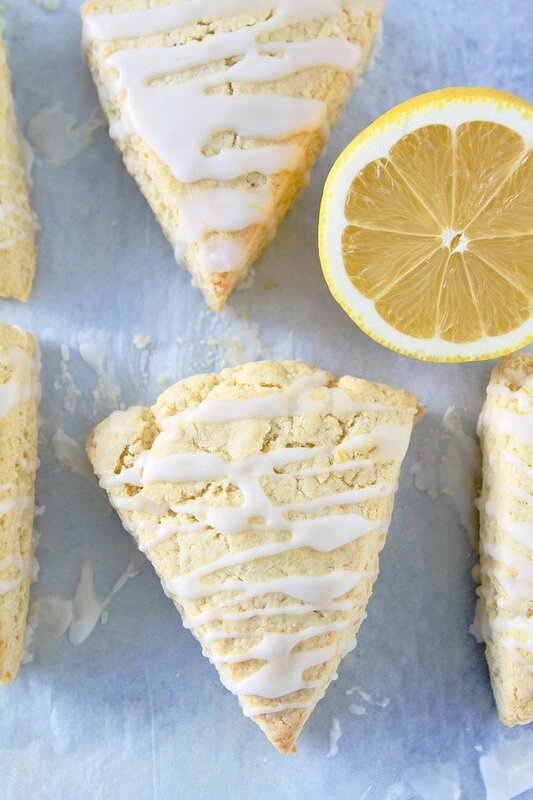 The burst of lemon is delightful, making these lemon scones refreshing and decadent! This scone recipe turns out the softest scones due to the use of butter AND cream cheese. The scones are easy to make because they are made in a food processor. They come together in no time. When the scone dough comes together, cut the scones into triangles. You can also use biscuit cutter if you prefer round scones. Both will be tasty! Bake the scones at a high heat. When the scones are done baking and slightly cooled, I drizzle a simple lemon glaze over the tops. The sweet glaze makes the scones even better. Sometimes, I like to eat these lemon scones with homemade jam too. They are such a nice breakfast or brunch treat. The scones are best the day they are made, but don’t worry, you probably won’t have any leftovers because they are TOO good! 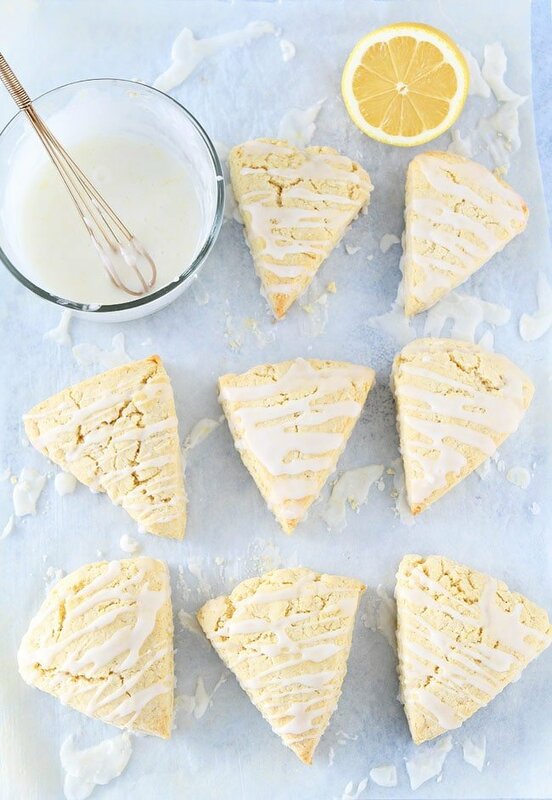 These soft and tender lemon scones are made with butter and cream cheese! They are easy to make and great for breakfast or brunch. Preheat the oven to 425 degrees F. Line a large baking sheet with parchment paper or a silicone baking mat. Set aside. In a medium bowl, combine the sugar and lemon zest. Rub together with your fingers until fragrant. Add the flour, baking powder, salt. Whisk until combined. Set aside. Place the cold cream cheese, butter, and eggs in the bowl of a food processor fitted with the metal blade and pulse to combine, about 6 to 8 times. Scrape down the bowl and add the dry ingredients, milk, and lemon juice. Pulse 3 more times and scrape again. Pulse a few more times until the dough comes together. Remove the dough from the food processor and place on a lightly floured work surface. Fold the dough over on itself a few times to make it smoother. Don't overwork the dough. Divide the dough in 2 equal pieces. Form each piece into about a 6-inch disk. Use a bench scraper or sharp knife to cut the disks into triangles. Place the scones on the prepared baking sheet. Bake for 15 minutes or until the scones rise up and are golden. Remove the scones from the oven and place on a wire cooling rack to cool completely. While the scones are cooling, make the lemon glaze. Combine the powdered sugar and lemon juice in a medium bowl. Whisk until smooth. Drizzle the glaze over the scones. Serve. These look delicious! I can’t wait to get my hands on a few of these scones! 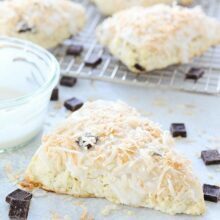 I love scones and I bet that cream cheese makes these incredible! So perfect for a spring brunch! hey girl- these scones look amazing! I have been craving scontes. I have been looking for just the right recipe for my first attempt at making them. I have found it!!! My food processor is too small to make this recipe. Can it be done with an old-fashioned mixer? I haven’t tried it, but I think that will work just fine! Enjoy! You can add sugar if you wish. It will give the scones a nice sweet crunch. The glaze will hide it though. Yes, you never want to overwork scone dough. It is delicate. I put a note in the recipe so others will be aware of this. Thanks for the feedback. Glad you liked them! When do you add the 1 tbsp lemon juice to the dough? 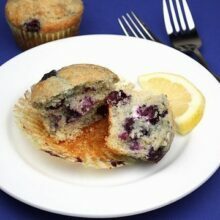 I’m making these this morning and keep scanning the recipe to see when to add it. Add the lemon juice with the milk. 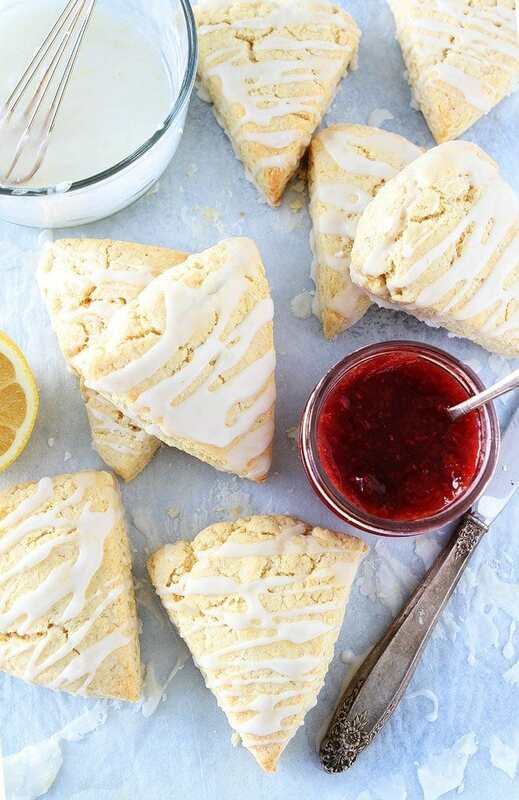 I wish a plate of these scones would magically appear in front of me too! These look like the perfect brunch treat! I’m baking these amazing scones for the second time in two days. I love all things lemon and the glaze makes these taste so good. I’d recommend using an organic lemon for the zest and juice. I think you can taste the difference! Oh, good! So happy you are loving the scones! I made these today and they were amazingly light and refreshing! The glaze was our favorite part! Next time I will add a little more zest and juice to the dough for personal preferences we like it with an extra punch of lemon! But it was soft on the inside and we loved that it wasn’t artificial! Hi! I am baking these scones today to serve tomorrow. Do I need to refrigerate overnight or will they be fine left out? Thanks! Fabulous scones! I grated the frozen butter and frozen cream cheese, stirred them into the dry ingredients with a fork, added the liquid and stirred it in with my hand until combined. Then a quick dump onto a lightly floured board and kneed a few times and you are good to go…handle as quickly as possible. HINT: to avoid slicing your finger open on frozen butter and cheese, cut the correct amount needed BEFORE you freeze them! I made these today. I’m on a lemon binge. They were easy to make and very yummy. Love these scones! They are the perfect level of lemony flavor. Thanks for the recipe! Tasty and tender. I substituted 3/4 cup of the flour with ground oatmeal and almond flour as well as added some shredded coconut to boost the nutritional value. Absolutely delicious! These are very yummy and easy to make. I didn’t have a food processor so I made them a little differently. I cubed my butter and cream cheese and cut it into my flower, suger, lemon zest mixture with a pastry pie crust knife thing, I don’t know the proper name for it. Then in a separate bowl, I wisked together my eggs, milk, and lemon juice. I then poored the liquid into the dry and worked it together to form my dough. It was a little dry so I added about another tablespoon and a half of milk. Perfect consistency. I pressed it out by hand and used a square cookie cutter to make large squares then cut the squares into triangles. Turned out a delectable golden brown, a little flaky on the edges, but very soft on the inside. They aren’t too sweet, which I like. Delicious! Moist and not too sweet. Perfect with a morning cup of coffee. I used the recipe as more of an outline and I was really happy with how they turned out! The dough was perfect– crunchy on the outside, super soft and pillowy on the inside. I was worried they’d be tough since I suspected I overworked them, but they were great! Will use this recipe again. What can I substitute for the cream cheese? Maybe buttermilk, but I haven’t tried it. The cream cheese really makes the dough. Wonderfully light and delicious just the taste for any lemon lover! My husband and work collegues can’t wait for the next batch. These were so delicious! Thank you for the recipe! Very subtle flavor, but they were still delicious. Next time, I will double the lemon ingredients and possibly add some blueberries! These are not lemony enough! Next time I am going to add double the zest and maybe 1/2 tsp lemon extract. Without the glaze you wouldn’t even know they were lemon scones. I used a hand mixer and it worked but just be sure to break up the cubes of butter and cream cheese. 6-8 times with a hand mixer is not enough.